Probably one of the most versatile clothing items you could ever own, this simple yet functional piece can do wonders in so many ways. From casual wear to more elegant and put together outfits, you could never go wrong with a plain white t-shirt. What's great about having this basic wardrobe staple is that you can pair it with practically anything - it caters to all styles. May it be a day at school or a night in town, wearing a simple white tee is always a great choice. Functionality and simplicity aren't the only factors why this piece of clothing is a must-have. Plain white tee's can be purchased at very low prices in local department stores. These can also come in packs/bundles which can save you more money instead of just buying one. Although if your wallet and conscience is up for it, you can purchase more expensive [and I guess higher quality] plain white t-shirts from certain clothing brands (i.e. Kanye West's $120 Hip-hop t-shirt). Throw on a plaid shirt, utility jacket, or even a hawaiian shirt to add print, color, and/or texture. If wearing just the t-shirt is too simple for your taste, try layering with different outerwear so your outfit won't look bland. If you're going somewhere that requires you to dress up, pair your t-shirt with more structured and tailored bottoms. This will make your whole outfit more put together and sophisticated. Incorporate bright colors to make your outfit stand out more. If you're not into wearing "in your face" colors, then opt for the classic black & white. 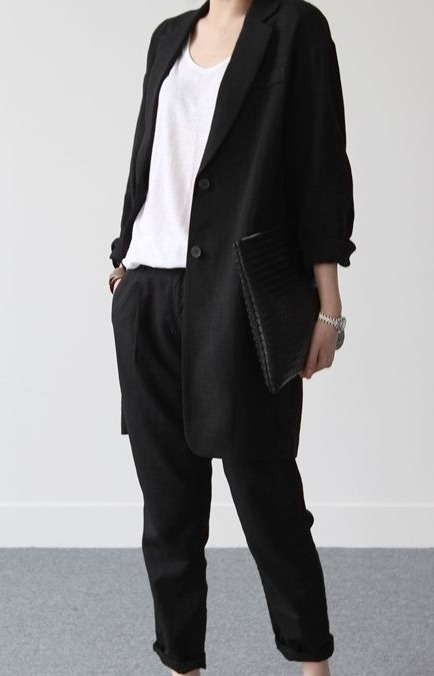 Put on black bottoms, outerwear, and shoes for the monochrome look. How would you style a plain white tee?